Daily Spirit & Word, 481: The Wideness of God’s Mercy. Good morning my friends, I hope your Easter Week is going well. Today we’re thinking of God’s mercy towards sinners. He’s just so outstandingly kind, gracious, forgiving, loving, gentle. When we hear of God’s wrath, anger and justice, we must always remember that they are tempered and controlled by every other aspect of His Divine Character. 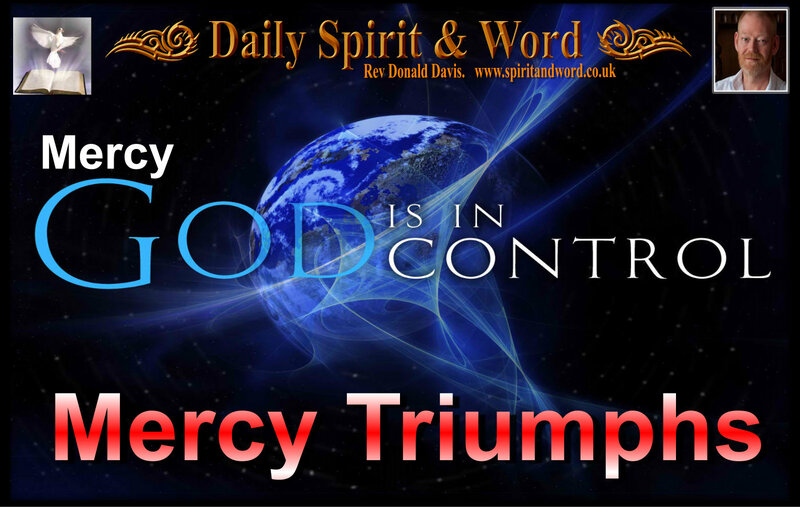 My friends there is a wideness in God’s MERCY that I believe we’ve only just touched upon. So many Christians it seems love to hear or talk about God’s wrath and anger against sin (and He is), but there’s also such a breadth to God’s Divine Nature that we miss out on when we simplify our focus too much. It’s not surprising that when we concentrate on just one characteristic that we produce lop-sided followers. It’s like we’re producing Disciples with limps or with a load on one shoulder and we do a real dis-service to God’s Kingdom. Not only that, when your Heavenly Father looks at you, He’s probably wondering why you’re not conveying the whole Good News. Can you see that my friends? God’s Justice and Judgement are good and righteous and necessary, but there’s a wideness in God’s mercy, that means because we’ve been forgiven so much, we should also extend that same mercy and forgiveness towards others. My friends, if you are sincerely desiring to follow after God, become more like Jesus, then you need to discover more about what God is like in His Character, the Holy Spirit will be moulding you into the same shape as Him. There’s no better place to look than to the stories of the Saviour, but the same nature and character are also revealed in the Old Testament. Read this Psalm out as loud as you can, get to a lonely place and shout it out, for faith comes by hearing the words of the Lord. 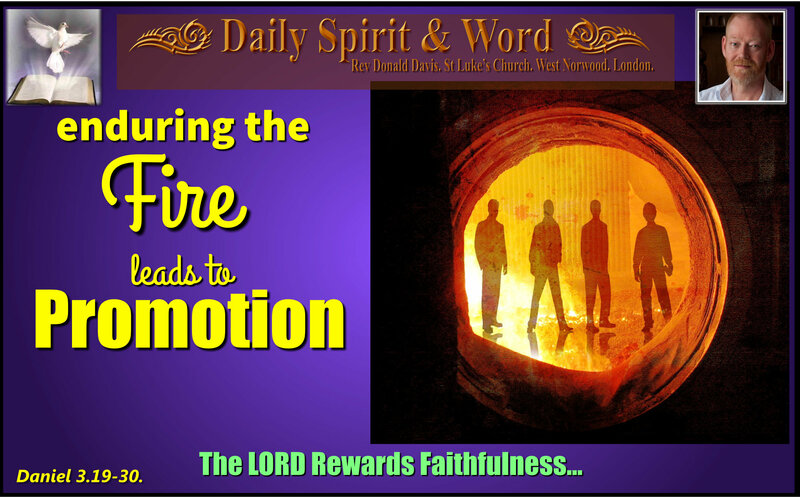 My friends, God’s MERCY will become evident when you HEAR God’s Word Today. Let His grace and kindness wash you clean. 1 [Of David.] Praise the LORD, O my soul; all my inmost being, praise his holy name. Did you shout it out? I’d have woken all the grandchildren, but I shouted it out in my mind 🙂 I’ll be shouting it when they all wake up in about an hour though. From the start to the finish this Psalm shouts out loudly of the wideness of God’s MERCY. The themes ringing loudly in your ears today should be: Forgiveness, Healing, Deliverance, Soul-Satisfaction, Redemption, Compassion, Renewal, He Fights For Justice, Gracious, Patience (slow to anger), Love (abounding in love), Cleansing from All sin, Praise the LORD my soul. One day when I was playing football (soccer) with my brother in the garden, I broke a big window. My mum shouted at me and told me to come into the house, she said, “Wait until your father gets home, he’s going to punish you severely for this”. All the rest of that day I was dreading the moment my dad got home from work. He came in and I thought at first my mum had forgotten to tell him, but then she did and my dad said, “Go into the bedroom, I’ll be in soon to sort you out boy”… I was crying and saying how sorry I was, it was an accident, pleading for forgiveness, but my dad’s eyes said it all. He came in and closed the door, then he said, “Get over my knees”. All the time me pleading, “I didn’t mean it”. Then he whispered in my ear, “make a loud scream and I’ll pretend to whack you” So that’s what we did, I creamed and he made a whacking sound. Then he said, “I know you didn’t mean it, but be very careful, you’ll have to work to pay for the window” I nodded and he said, “Now go in and rub your bum like it hurts”. My brothers and sisters and mother were all looking at me when I went in and I played my part and pretended to be hurt. “As a Father has compassion on his children” My dad gave me a great lesson that day. I deserved punishment, it was in the days when parents disciplined their children and I knew I was wrong, but he had mercy upon me. Earthly fathers love their kids, but God our Heavenly Father has so much more compassion, He doesn’t punish us as our sins deserve (Verse 10). Does this remind you of the Lord’s prayer? It should. It ends as the Lord’s prayer begins, but the themes of God’s grace and mercy are as evident. Pray this Psalm, let His Character soak your soul and sing songs about how merciful our Father in Heaven really is. He’s forgiven me so much, and yet He’s calling me to a higher walk with Him. He knows what I’m like, yet He’s crowning me with glory and honour. How can we not PRAISE the LORD, O my soul. Turn and again and dust yourself off my friends, get cleaned up and wash your hands to serve the Lord. Let His kindness, mercy and grace wash over your soul today. Jesus died to set you free from sin. Live in that freedom, knowing the depths and wideness of God’s mercy and how it triumphs over judgement. 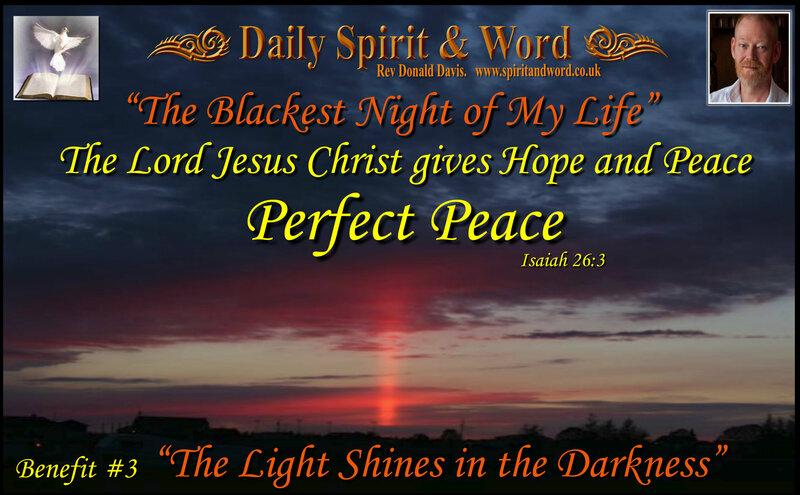 Daily Spirit & Word, 457: Hope and Peace in Times of Despair. Seven Benefits of Bible Memorisation. Benefit #3: Bible Memory Training: God Gives Believers in the Lord Jesus Christ: True Hope and Peace in Times of Despair. As I write this morning, I’m reminded of the blackest night of my life, the day whilst at Theological College we were about to attend the Leavers Ball. Someone came running to me and said, “There’s an urgent telephone call for you”. It was the day’s before the advent of Mobile Phones. We, Julie and I, took the call in the little phone booth that students used. My wife had left our children (five of them) in the care of friends in Plymouth, two of them with our Minister and his wife. The call was from his wife, she relayed the devastating news as only a Christian could, “You daughter is OK, but she’s been assaulted” When someone says that about your most precious daughter your mind goes into a whirl. I had to ask her again and again for the details, even then not fully comprehending. She was reluctant to tell us too much, fearing that we’d have an accident as we drove back from London to Plymouth. All I remember asking was; “What happened?”. The next thing I can recall as clear as light was hugging my sobbing wife, she was inconsolable, but I just hugged her. Then just before we were about to dash off home an brother in the Lord who’d become a great friend over the years of college said, “Let’s kneel down and pray to the Lord”. It was the last thing that I wanted to do at that moment, I wanted to get into the car and head-off as fast as we could. But I knew Charity was right, so we got on our knees before the Lord Jesus and through tears we both prayed. Charity was a strong-tower and declared Jesus peace over Julie and I. It was on the way home, in the darkness and driving rain that it happened. We were passing a little hillock in Dorset and on the top of the hill I saw a bright light giving of strange beams, like a searchlight, it was hard to make out, but it was there, then it pointed up into the sky; Julie was driving at almost 100 miles per hour. No amount of my telling her, “slow-down” made the slightest bit of a difference. As I looked out of the rain’s tears on my car’s window, I saw that light pointing up into Heaven; then all of a sudden the Lord’s PEACE flooded my soul. In that DARKEST NIGHT of my life, PEACE and CALM like I’d never know before. The light pointing to heaven reminded me of my prayer and Charity’s prayer for peace. It was a miracle. I knew we were heading home to the tragic news that my precious ten-year-old daughter had been raped at knife-point with many terrible things done to her in that attack. Her childhood stolen and destroyed by a viscous, evil and callous act. That one horrible night led to years of deep heartache and slowly getting back to ‘normal’, but when that PEACE came in the driving rain it stayed with me throughout those years and I was the only one in the family to turn to the Lord and receive His peace, hope, joy and comfort. The Lord was preparing me to be a source of strength for everybody else in my family. My wife blamed hereself and for years couldn’t make decisions, my daughter had night terrors for years, screaming in the night. But the PEACE, it came from above and would not go away. I remember a few months afterwards reading Psalm 23 with my daugher who’d been attacked, and she said, “That was me wasn’t it? I walked through the valley of the shadow of death” I said, “You most certainly did”. Then she asked me, “Why didn’t Jesus rescue me?” I said, “He did, you are here today to tell the horrible story and one day you’ll be able to give strength to many more people who are going through hard times”. There was a verse that I’d learned on the day we got that horrible telephone call; when we received the tragic news, you know how a verse sticks out sometimes when your reading God’s Word. Well I committed it to memory quickly, not knowing why the Spirit had illuminated it, it came flooding back into my mind after seeing the beam of light on the hill: Isaiah 26:3 “You will keep in perfect peace him whose mind is steadfast, because he trusts in you.” You know my friends, I can testify to the truth of that verse from God’s Word. He DID keep me in His PEACE. Though there were times when I could easily have turned the other way, Jesus was always there for me and keeping me in His perfect peace. Hope and Peace in Times of Despair. The full meaning of that verse became apparent about a year later when I shared my testimony in Northern Ireland. At the end of a week of Evangelistic mission activity in the small town of Warren Point. In the Town Hall on the last night I shared my story and what had happened to my daughter, but I kept the focus upon how the LORD had given His peace and hope in my heart. In Northern Ireland during the mission, it was the height of ‘The Troubles’, but whilst the mission was going, we only saw one riot in Downpatrick. The Town Hall was full, and so many people were crying that night and when we gave an invitation for people to receive the Lord Jesus, I think everybody in the hall came forward to be prayed with. It was awesome. Even a Minister, who’d been ordained for years, who I’d become friends with during the mission, but through the conversations we’d had, I knew that He’d never trusted in Jesus for Salvation, because Ministry was a job for him a vocation of choice to serve the community. He came forward and through tears made his confession and gave his life to the Lord Jesus Christ. The PEACE has been with me in many troubled times since, but I’ve also been reminded, I need to turn and trust in the Lord always. My friends, tragedy may come into your life, but whenever the Lord gives you a text from His Word, you’ll be wise to commit it to your memory banks. He’ll use it again and again and again and again, to bring strength and comfort and deep knowledge that He’s faithful to all his promises in his word. He KEEP you in Perfect Peace when you fix you mind upon Him. Since that Blackest Night of My Life: I’ve had countless scriptures the Lord has given me to remember forever, they come either just before or during the times of despair and need. Psalm 77 (Easy to remember) 7/7 you know the shops that are open 24/7 seven days a week? Well, I remember that Heaven is OPEN 7/7. 24 Hours a Day Every Day. Though we may not be able to sleep sometimes for fretting, when we turn to the LORD, He’ll give us His PEACE and HOPE even in Despair. In the Darkest Nights of your life, He’s with you and is available. Call to Him for He is near. Also Psalm 40 The whole psalm, but especially Psalm 40:9-10 was given just before the Mission to Northern Ireland, it really did come true in the Town Hall in Warren Point. Have an awesome day with Jesus, be filled afresh with the Holy Spirit. [For the director of music. For Jeduthun. Of Asaph. A psalm.] I cried out to God for help; I cried out to God to hear me. “Will the Lord reject for ever? Will he never show his favour again? Has his unfailing love vanished for ever? Has his promise failed for all time? Bible Memory Training: Benefit #3 Hope and Peace in Times of Despair.